In a previous post, I listed some of the essential tools of our homestead (see A Homesteader’s Tool Box). The idea came from my response to Sam Sciapaldi’s question for an article she planned for her website, Hello Homestead. When I read the final article, I saw that I’d forgotten one of the most essential homestead tools of all: safety goggles! Perhaps I consider goggles more a safety item than a tool, (which wouldn’t explain why I thought of dust masks for the article, but not goggles). However, I rely heavily on safety goggles for protection; I feel naked without them. 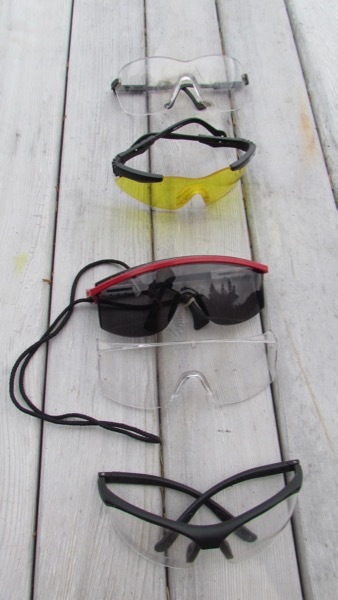 My four most commonly-used pairs of safety goggles (Photo: Mark A. Zeiger). A while ago, Sam Schipani of Hello Homestead asked me for a list of essential homestead tools for this article she subsequently wrote. My reply seemed like a worthy blog post. A good pocket knife! : even though I didn’t intend to rank these, the first tool I thought of is probably the most important. I carry a camp (a.k.a. Boy Scout) folder pocket knife every single day—for so long, and so faithfully now, that the bale rivet has worn down so much that the bale’s coming loose, and the razor-thin head is cutting holes in my pocket linings! The best homestead tool is the one you have on hand when you need it. I always make sure my pocket knife is on hand (see Constant Companion). 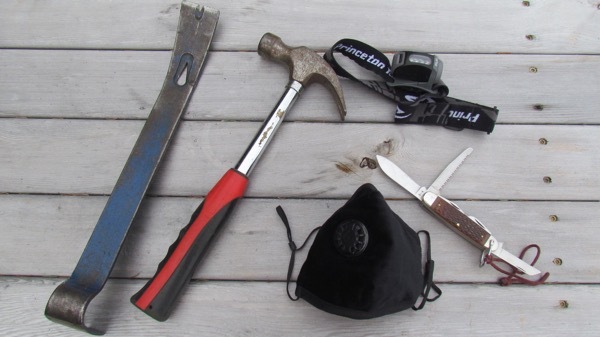 Some of the homestead’s essential tools (Photo: Mark A. Zeiger).